Please note: Product packaging as shipped, may not match image on website due to packaging updates by the manufacturer. Clinically proven to instantly relieve dry, itchy skin and help control future flare-ups. Ceramides are naturally found in skin's vulnerable outer layer and help skin retain moisture. When skin's ceramide levels are low, skin has difficulty retaining moisture. 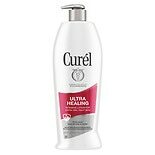 While traditional lotions only hydrate skin's surface, Curel® moisturizers work at the source of dryness to help replenish skin's ceramide levels, not just relieving symptoms, but actually, over time, preventing symptoms from recurring. 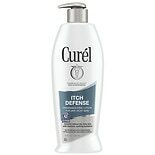 Curel® Itch Defense® Lotion instantly relieves dry, itchy skin and helps control flare-ups, while restoring skin's moisture barrier to keep irritation from coming back. Curel® Itch Defense® lotion was also granted the National Eczema Association Seal of Acceptance™. Products eligible for the Seal of Acceptance can be used for people with eczema or severe sensitive skin conditions and have satisfied the NEA Seal of Acceptance Criteria. For best results, apply daily to dry, itchy skin immediately after the shower or bath. Reapply as necessary. © 2016 Kao USA Inc.